How to be a true Parisian it-girl? How inexplicable Parisian women are, – wrote Balzac. Maybe their charm lies in this inexplicability? How does a true Parisian woman live? What kinds of sport are the trendiest in the fashion capital at the moment? Where do Parisians meet their friends, where do they go shopping, what do they eat? I have lived in Paris for nine years already, and I’m happy to tell you about the routine of Parisian women’s lives and the secrets of their charm. Here are the Healthy eating habits of Parisiennes! Let’s start with what Parisiennes eat. 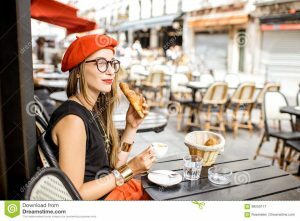 Somewhat surprisingly, HER breakfast wouldn’t correspond to a belief in healthy living: coffee, croissants, a sandwich of bread and butter and orange juice. All French people, male and female, have breakfast like this. And this is at its best! Or just coffee. But The French don’t snack between meals and eat strictly on the bell. At 12.00, at the latest 12.30 – lunch. It’s very trendy in Paris at the moment: there are all sorts of vegetarian cafes, bio restaurants and what are called “soup bars” and “salad bars”. There are all kinds of those bars in the business quarters. It’s useless to say that it’s mostly Parisian women and not men, who are so crazy about healthy nutrition. So, a Parisian it-girl has her lunch in some fashionable café with dishes of organic products. For lunch she’s used to having soup, salad, fish, and – yes – she counts her calories. A true Parisienne, even the slimmest one, always wants to slim, just a bit… Certainly, deep in her mind she knows that she doesn’t need to and she’s absolutely irresistible. Parisiennes – I ‘don’t mean foreign inhabitants of Paris, I mean here only innate Parisiannes – very seldom have any overweight issues. Generally they are very slender. But let’s be frank. Paris’ Italian restaurants with 30 kinds of pasta are quite crowded at lunchtime. Mostly their public are students. The wealthier a Parisienne is, the less frequently you’ll find starch in her diet! In my next post – don’t miss it – I’ll tell you about Parisian girls’ favorite supper dishes, supper it-places and tips!